The dark Hunter series is slowly becoming one of my favourites. Sherrilyn Kenyon has this great way of giving her characters so much sorrow it's almost heart breaking, then allowing them to have the greatest love. Zarek is about as tortured as they come in the dark-hunter world. Everyone sees him as 'insane' and some are genuinely terrified of him. Astrid comes to zarek as a blind woman letting him stay in his house to stay out a storm. I love this book!! zarek is such a complex character. He has so much depth that I can't help but love him where I hated him in previous books. 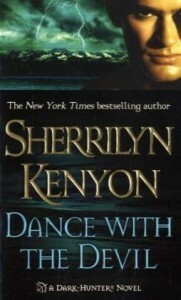 Another successful book from the amazing story-telling mind of Sherrilyn Kenyon.